The heated blankets that are on the market today are a world away from the electric blanket of the past. They are lightweight, come in super luxurious fabrics, have much-improved safety features and are incredibly energy efficient. If you are looking to keep warm and save a bit of money on your heating bill in the process, look no further. 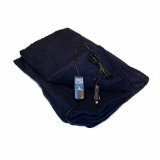 The most important thing to need to know before you buy an electric blanket is that there is a reasonable chance that you might get a defective product that won’t work or will only work for a brief period. The industry tends to have a pretty high failure rate for even the best-rated products; it is just part of the risk of buying electric bedding. Because of this problem, it is essential that you keep your receipt, you try out the product as soon as you get it, and you register your blanket for the warranty. If you do get a dud, it most likely won’t work right away or within a few weeks. If that is the case, most stores have at least a 30 return policy that you will want to take advantage of. It is much easier to return a product to the store than trying to get a replacement through the warranty. Start using the blanket as soon as you get it, so you know if it is going to stop working within the return window. Most blankets have between a 2 to 5-year warranty, when you have bought a product ensure that you register it according to the directions in the manual. Most of the major companies are pretty good about honoring their warranties, as long as there has been reasonable care taken with the blanket. You will probably have to pay for shipping if you end up having to send the product back to the manufacturer. 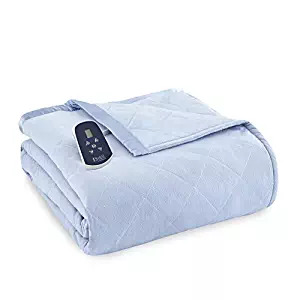 It is unfortunate that there are so many electric blankets that don’t work, but if you are like the majority of people who get a good one that works well the benefits are worth it. You will love having an electric blanket. Whichever brands you choose, make sure that you save the receipt. Due to the older generations of electric blankets short-circuiting and causing fires, electric bedding doesn’t have the best reputation for safety. The options that made today are much different from the products that were available 30 years ago. Manufactures’ have improved the technology and the safety warning systems of the blankets that are currently in stores. Almost all of the blankets that you can buy these days come with automatic shut-off if it overheats. Although you have to remember that they are electrical devices, so there are some risks involved with using this type of product. Make sure you read your manual carefully especially. A lot of users seem to ignore some of the safety tips like not using an extension cord or not using it with other heated products. Another warning that people like to ignore is that you shouldn’t let your pets on the blanket. Of course, they love it, but it is for their safety that they don’t go on it. The other big worry over electric blankets is the idea that they are dangerous to your health. It stems from some early research that linked exposure to electromagnetic fields (EMFs) which electric blankets produce in low quantities to a possible increased chance of getting some forms of cancer. EMFs have been heavily studied, and the most recent studies have not been able to find a link between EMFs and cancer. If you are worried about EMFs, then it is probably best to look at other alternatives. Choosing the right blanket can be fairly subjective because most have pretty much the same kind of features for the most part. The big differences are going to show up in the fabric/material, color, whether you want digital or analog and size of the wires. Fabric – There are a lot of great fabrics to choose from when buying heated blankets. You can get natural or synthetic materials. Lately the most popular fabrics are the microfiber fleece or micro plush fabrics that are very soft and cozy. Warranty– As mentioned above, pay close attention to the warranty of any blanket you are thinking of buying. Since electric devices do have a habit of malfunctioning, you want to make sure that you have coverage. Most warranties run from two to five years. Washable– Almost all the blankets that are available are washable to some degree, although you should look for products that are good enough quality that they will able to withstand cleaning. Just because a product can be washed, it doesn’t necessarily mean that it will be in great shape after you clean it. Safety requirements– any blanket you purchase should have a UL safety listing. UL (Underwriters Laboratories) is an American global safety consulting and certification company, so to have a UL listing means that UL has tested representative samples of the product and determined that it meets their Standards for Safety requirements. Sizing- You can get a blanket to match any size of a mattress. Most queen and king sizes will come with dual controls, which means that two people who are sharing a bed can set the heat level for their side individually. Never buy a blanket that is too big for your size bed, it can become a safety hazard. Programmable Settings – A handy feature that is available on some models is are settings that allow you to pre-set a maximum heat setting at a particular time. Digital or analog – When shopping for a blanket one of the big choices you will need to decide is whether you would prefer a digital control or analog control. Digital means that you are using buttons to change the heat setting, while analog implies that you are using a dial to adjust the heat setting. One of the big product testing websites found that analog dials are more accessible for most people to use rather than having to push down on the digital buttons to change the heat level. It comes down to personal preference; there is no advantage to either style. Price – You can buy blankets for a wide range of price points, and while the cost can seem a bit pricey, you will save money on your energy costs because you will have no need to run your furnace at full force overnight and will ultimately save money. Length of power cord -Since manufacturers recommend that you don’t use an extension cord with heated bedding, you may need to be aware of the length of the power cord in case you are limited with your power source. The number of heat settings– Most of these products comes with settings for a pre-heat as well as around ten heat settings. There are some blankets that only offer low, med, and high settings, which may not be enough customization of the heat for some users. 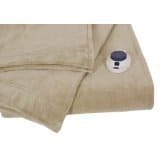 Low Voltage– Due to concerns over EMFs (some studies have linked exposure to EMFs to some cancers) it is possible to purchase electric blankets that work on a low voltage of 12 to 24 volts, as opposed to the 120 volts of a regular heated option. These types of blankets are considered the safest. Dimmer– Your control should have the ability to allow you to dim the display to avoid having a bright light beaming while you are trying to sleep. Preheat – The preheat mode will allow you to heat your bed; the time of the pre-heat varies from 5 minutes to 20 minutes on most models. Who should not be using Electric Blankets? While electric blankets are great for the majority of people, manufacturers recommend some people should not use electric blankets. On this list are: infants, children, an incapacitated or immobile person, anyone who is a paraplegic or quadriplegic, people who have diabetes, those who are insensitive to heat and have poor blood circulation, and anyone unable to understand or operate the control. If you are pregnant, use a pacemaker or any other type of medical device you should check with your doctor before using. You should also never use this type of product with someone who has an oxygen tank. When buying heated bedding, it is essential that you buy from a company with an outstanding customer service reputation. Avoid any companies that have a reputation of not honoring the warranty, or who make it hard to get replacement parts. Sunbeam: Sunbeam has put all of their instruction manuals on their website. You can contact customer service through a form on their site or by calling 1-800-667-8623(U.S) or 1- 800-667-8623(Canada). Replacement controllers can be ordered by contacting customer service. Biddeford: Biddeford customer service can be reached at 1-800-789-6441 from 8 am – 5 pm Central Time. 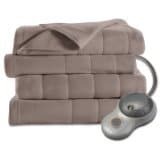 Electric blankets are incredibly beneficial for a variety of reasons. The obvious one being that it will keep you warm in colder weather. It will also help save on your heating bill, as you will be able to lower your thermostat and not have to heat your entire house overnight if you so choose. For each degree that you lower your thermostat, it is possible to save 1% to 2% on your heating bill. There are also some health benefits of applying heat for various ailments. Heating blankets can be very particularly useful for those who have arthritis, fibromyalgia and back pain. The warmth will increase blood flow to your muscles helping them to relax, ease the pain, and improve range of motion. If you are sharing a bed with someone who prefers to have the heat a different level than you, the larger sized dual control blankets can offer a customizable heat level. That will make sleeping much for comfortable for both people. An electric blanket is one of the cheapest and easiest ways to stay warm in the winter and reduce your energy bill. However, using heated bedding isn’t as simple as purchasing the product and plugging it in. You must be sure to use and maintain it properly to avoid any safety risks since it is an electrical appliance. Even though heated bedding is much safer today than in the past, you must ensure that you read the manual carefully and follow all instruction and advice. Some risks can develop from poor maintenance, but that shouldn’t be a problem as long as you follow the directions. It is especially important to read carefully and follow the washing instructions if you don’t’ you could damage the blanket or cause a fire hazard. Don’t dry it in a laundromat dryer; they tend to be more powerful than home dryers and could damage it. Make sure you turn off the power when the blanket is not in use. Always keep the electric cord and switch outside the bedding. You should expect to get about five years of use out of a heated blanket. Depending on the brand the warranty can be anywhere from 2 to 5 years. As long as you haven’t received a defective product and treat it with reasonable care the somewhat high initial cost should pay off over the long run with cost savings on your heating bill. If the blanket is over 10 years old, it really should not be used. The fire hazard that is associated with heated bedding is generally from older products that should be replaced. 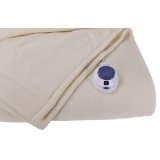 This is our top pick for best overall electric blanket because it is a newer model that has all of the latest technology and safety features. Customers love the microplush fabric, the quick heating rate and the durability of the blanket. Not only is it incredibly soft and comfortable, but you also cannot feel the wires, and it comes in some great colors. The controller is digital and very easy to use and reviewers and experts alike give this blanket a very good rating.